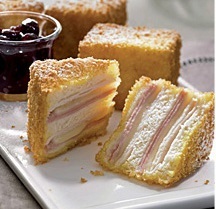 There is no more popular a sandwich at the restaurant than the Monte Cristo Sandwich. It is a favorite restaurant recipe at breakfast, lunch and dinner. This restaurant recipe uses thick egg bread rather than white bread since that variation is what the guests prefer. The sandwich is also dusted with powdered sugar and served with jam or preserves as was done originally. Many people think this sandwich is actually a variation of a grilled cheese sandwich that used Gruyere cheese and lean ham between two slices of crust-less bread, fried in clarified butter. That sandwich was served at a Paris cafe about 1910. It was, and still is, called "Croque Monsieur." 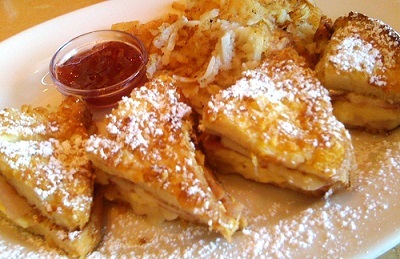 Somehow the original French sandwich was modified by Americans from the 1930's into the 1950's and has become known as the Monte Cristo. Regardless of its origins or modifications, this restaurant recipe creates one of the best-selling, most popular sandwiches ever. Preparation time: 20 minutes. Makes 1 sandwich. It is best to store the sandwich in the refrigerator with a weight on it for a few hours before cooking because it will hold together better on the grill. 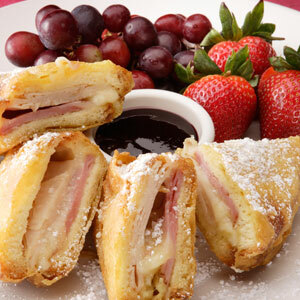 Enjoy your real restaurant recipe for a Monte Cristo Sandwich, the company of those you share it with. It truly is a favorite restaurant recipe. And thanks for visiting! Did you know? In the 1930s–1960s, American cookbooks had recipes for this sandwich, under such names as French Sandwich, Toasted Ham Sandwich, and French Toasted Cheese Sandwich.